Initiated by Tabula Rasa Gallery, the Space Exchange Project aims to promote cross-regional collaboration between art institutions in different parts of China and to encourage communication between artists through “gallery occupations” that regularly swap exhibition contents between different galleries. 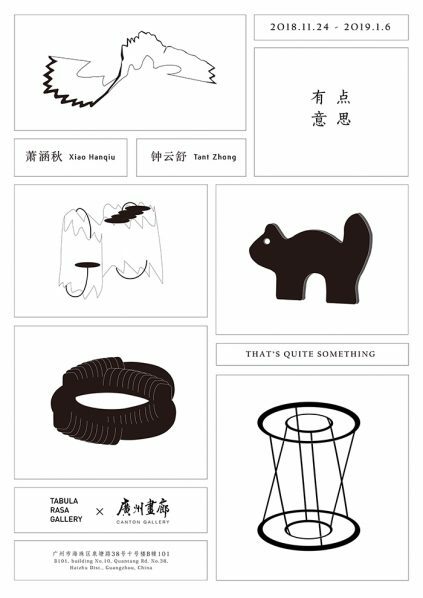 Following the group exhibition “Chen Pai’an, Wong Wing Sang, Wu Sibo”, a collaboration between Tabula Rasa Gallery and Canton Gallery that took place in Beijing in May, 2018, Canton Gallery will present “That’s Quite Something” (November 24, 2018 – January 6, 2019), an exhibition of the latest works by artists Xiao Hanqiu and Tant Zhong. During the process of creation, Xiao Hanqiu often feels as though she has lost her physical vision: instead, her deep emotional connection to people, objects and events become her eyes, and her imagination of the frames of things encourages her to keep perfecting the art of “perception” and to become one with her surroundings through the dissolution of her own “existence”. On the other hand, Tant combines different media and materials in her work and manages to construct a subtle, seamless extension within a limited space by “controlling” the natural tempo of everyday objects. She attempts to balance different forces and stores this intention briefly in the folds of time. Xiao and Tant’s works have both left tangible trails on the coordinate plane of space and time; with traceable outlines, their creative practices coincide and become “quite something”. Tant Zhong’s works are hard to classify, fluctuating between raw formalism and comic whimsy. Mass produced objects are elevated into sensual arrangements that shelter unexpected jokes. Often her works lack definitive boundaries, spilling into each other and absorbing space, leaking their world view out of the gallery and into the wider world. Implicit in the works is a challenge that all things can be seen formally and elevated to the realm of aesthetics, never forgetting the absurdity of such a task. Courtesy of the artist and Canton Gallery, for further information please visit http://cantongallery.com.cn.